Describing myself feels like a loaded task because I often tailor my description of myself based on the audience I'm speaking to. I'm both British and Nigerian; these two identities are very important to me because they bring different things to my life. My British-ness was not a birthright, I earned it, or rather my mum did. I saw my her struggle through indignity after indignity to finally gain legal British citizenship for my brother and I. I claim my British-ness because it reminds me that my mother is my superhero. It also makes it easier to go through airports. I have a more intimate and honest relationship with my Nigerian-ness. Being Nigerian, in my experience of life, is like living in the middle of the Langston Hughes poem, "I, Too". Before I turned 10, I had no real awareness or concept of race. I lived in Nigeria where everyone was black, so the delineating factors were tribe and wealth. When I was five, I knew I was Yoruba and I knew that I was rich. those two categories gave me a lot of comfort. I was so rich that it was improper for me to speak to or associate with people that were, or seemed poor. I was smart, so I couldn't be seen talking to someone that was dumb. The things I charge against now; discrimination and other-isms were things I perpetuated against people for no reason, because I was too lazy to go against the status quo and do something different. I didn't even know there was something different to be done. We moved to London, the great financial leveller. I realised my status had changed and it didn’t take long to figure out what my new status was. I was broke, and I was black, but not the “cool black”. I was the kind of black that black kids made fun of. I had a name no one could pronounce and if they did it sounded like "bum on loo" and that's not my name (my given first name is Bomonlu). I became so desperate to not be treated like I had treated people in the past, that I essentially made myself a go-for, a servant to anyone who was willing to treat me even remotely well. I'd given myself a complex. In this picture I am stealing a pinkie full of cake, and you can see my brother's alarm bells ring. I was super confident as a child and its really taken me all these years to gain my confidence back. In the photo I am speaking at an event at the KPMG office in London. After my rousing speech, one of the questions asked was, "how are you so confident?" The question isn't intended to be offensive, but it was. Having been bullied for many years, I found that a lot of my confidence was wrapped up in whether or not people liked me. I have spent a lot of time on myself over the past few years and in that time I realised key things that I want to signify. My identity is entirely my own, of my making and no one else's. After spending so many years as an incorrigible people pleaser, it’s very important for me to know that the things I'm doing are because I want to do them, the things I'm wearing are things I think are great, and things I laugh at are things that I actually think are funny. I have a really weird sense of humour, its super random and most people don't get it, but I love it. You might not think I'm funny, but I think I'm hilarious. When I was at University, and the people pleasing gene was still strong, I was trying to find a way into the in-crowd. One lunch time I was sat in close proximity, perfect eavesdropping distance; my plan was to one day find an opportunity to drop into conversation with a particular group, become friends with them and as usual gradually become their unbridled servant. Anyway, the apparent nice one in the group, like in a boy-band there is always a nice one, had just gotten a new phone and was playing around with the settings, showing off his new gadget. I had also recently purchased a new phone so I thought, "yes, I'm about to make it." As I was planning the perfect thing to say, he moved on into conversation about a weird missed call he had logged on his phone, it was from Nigeria. Oh snap the stars were aligning. Then he said, "I can't believe my new phone is involved in scams already." I replied, "don't say that, it could just be a wrong number", his retort, "unlikely, it’s probably some prince asking for money" embarrassed me. To put him in his place and return the feeling I replied, "I'm Nigerian." Ooh burn. He shrugged his shoulders, carried on with his conversation and couldn't care less. He was the nice one! Just like that, I was done. The energy I had previously been putting into getting people to like me was now entirely focused on one thing; getting people to like Nigerians. Somehow, I decided that my personality defects were actually the result of governmental failures in Nigeria. If the government was better at their job and made Nigeria the envy of the world, I wouldn't have to turn myself into people's slave to be liked, they would just envy me because I was Nigerian, like people around the world envy Americans and the British and the French. That was the thought process. Personality defect ridden and all, that feeling, that experience is the reason I started my company, Do it Now Now. Six years after that occurrence, I had become a much better human being, but my belief that there was something to be done to help change the narrative of Nigeria and other African countries turned into a constructive desire to support the development of entrepreneurship ecosystems in African countries that create jobs and generational wealth for everyone. 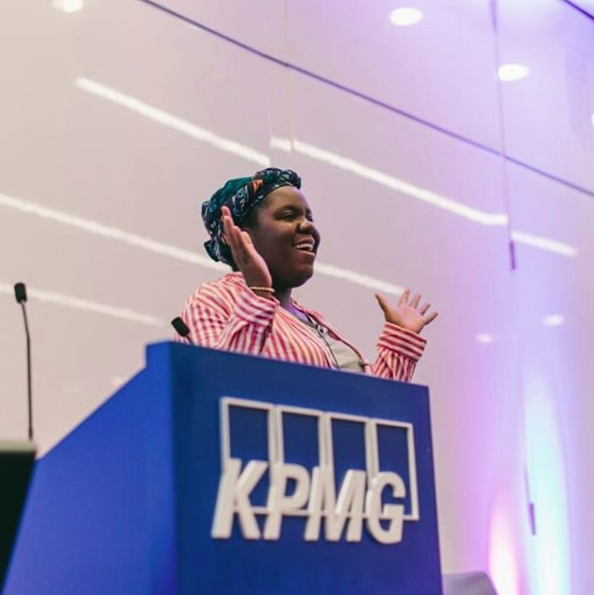 In the photo I am speaking at our event at the Google for Start-ups Campus in London; they've partnered with us to build an African entrepreneurship initiative in the UK and across 5 African countries (Uganda, Nigeria, Kenya, Ghana and South Africa). After a few years of working to make a difference in the space, we now work with companies and charities with more resources and deeper pockets to make sure future generations don't have to deal with passive aggressive abuse from "nice" British boys. By the way I don't call that racism, that's just racial insensitivity. It’s just a nice, normal, average white boy letting the world know that he is a nice, normal and white, and like most, has never had to think of the world as an experience outside of his own familiarity with it. I am much less precious about my African identity than I may be assumed to be. I find that when I wear my headscarf at an event or speaking engagement, I am assumed to be representing something bigger than a bad hair day. Like I said earlier, I lean into it and I do use it to my advantage. In this picture I am with three invited speakers at an event about African tech investment that I hosted during Black History Month. This, I suppose, is where I get a little controversial. Unpopular opinion: you don't have to be black to be passionate about the development of Africa. The people in that picture are three of the most influential people in the African tech ecosystem, we recognise that privilege is at play, but there is no point in complaining about it, find a way to work the system to benefit you and the cause you're fighting for. I didn't choose to move to Britain, I was moved to Britain. I have lived in this country, the UK, for 18 years. Hence, I didn't grow up with the cultural background my fellow Nigerians grew up with, and I was too busy trying to fit in to bother to seek them out. I don't listen to Afro-beats. I can't dance to save my life. I'm more likely to listen to One Direction than Davido. When I speak in a Nigerian accent, I sound like I'm trying to mock rather than communicate. But, I do love my country. I love its people. I want so much more for it that we have and I pray for for its future and the future of the continent fervently. I guess the easiest way to sum this up is, both literally and figuratively, I understand my language, even though I can't speak it.